Ages 8 through 17. Use the worksheet activities in this book to teach subject-verb agreement, irregular noun and verb forms, verb tense, irregular past tense verbs, conjunctions, adverbs, contractions, prefixes and suffixes, and knowledge of parts of speech. As students complete the worksheets, they fix grammatically incorrect sentences, complete sentences using appropriate grammatical forms, add appropriate endings to words, etc. Humorous short stores are included! Part 1 - Exercises for Specific Language Structures. Part 1 of this book is divided into 20 units. Each unit emphasizes a specific language structure or part of speech. Plurals, verb tenses, and other basic structures are included. In addition to activities relating to components of English grammar, the book includes lessons relating to structures within words (i.e., prefixes and suffixes). Exercises for Sentence Practice. 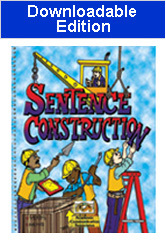 The activities in Part 2 of this book reinforce stills emphasized in Part 1 and provide practice in constructing a variety of sentence types. Students are asked to identify errors in sentences and to rewrite these sentences. They are also asked to finish incomplete sentences, to edit stories containing grammatical errors, to create sentences using specific words and phrases, and to combine several sentences into one. The activities help students to increase the length and complexity of their sentences.